How do you load a black powder gun / Muzzleloader? The National Muzzle Loading Rifle Association created a “How To” document (Muzzle Loading PDF) with diagrams and detailed instructions. What is the History of the Fur Trade Rendezvous? Between the years of 1825 and 1840, hundreds of fur trappers came together each summer to a pre-determined rendezvous location in the Rocky Mountain region. The tradition of the rendezvous was started by General William Ashley and the men of the Rocky Mountain Fur Company in 1825. Rather than having the trappers spend considerable time traveling back to St. Louis and civilization in order to sell their furs and to resupply, Ashley would bring the supplies to the trappers. Thus was born the tradition of the Rocky Mountain Rendezvous. After the first rendezvous, the tradition of the rendezvous swiftly evolved into a wilderness party lasting anywhere from a couple of weeks to eight weeks. The gathering was not limited to trappers, but also attracted Indians, French Canadians, native wives and children of the trappers, travelers bound for Oregon, and in the later years even tourists and sightseers from as far away as Europe would journey out to the mountains just to observe the spectacle. Total attendance at the rendezvous might exceed 2,000 individuals in some years. At these rendezvous the trappers traded the furs they had accumulated over the past year for whiskey, guns, powder, lead, traps, horses, tobacco, salt, sugar, beads, cloth, knives, kettles, blankets, coffee, mirrors and more. They held competitions of shooting, knife and hawk throwing, and horsemanship. They gambled, and told lies and tall tales. Although the business of exchanging furs for supplies was generally concluded within a few days, the participants would start gathering a week or more prior to the expected arrival of the supply pack train, and festivities might continue for some time after the pack train loaded with furs had departed for St. Louis. After rendezvous was over the often now penniless trappers would head off to their fall trapping grounds to accumulate furs and skins for the next year’s rendezvous. In 1840, with almost no demand for beaver because of the new popularity of silk hats, the last official rendezvous was held. Alfred Jacob Miller painting. 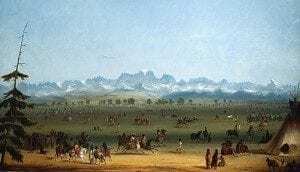 Miller was the only known artist to have painted scenes of the Green River Rendezvous from his own experience, and he secured hundreds of images from the 1837 trip he took in the employ of Sir William Drummond Stewart, a Scottish nobleman who came to American annually to hunt in the Rocky Mountains. What is a modern day Rendezvous? A modern Rendezvous is a historical reenactment of the gatherings of Mountain Men during the fur-trade era of the American West. Lovers of America’s early history get together and create a historical period camp that re-creates the sights, sounds, and feelings of the past. Participants are modern day “mountain men”, women and children, and the rendezvous is a fun “family event”. It is a way to get away from the pressures of modern society, and can be as varied as the folks who put them on. Most rendezvous include shooting matches with muzzle loading black powder firearms, tomahawk and knife throwing contests, kid’s games, frying pan toss, seminars, liars contests, and evening “socials” to participate in. Reenactors set up teepees, canvas wall tents and lean-tos. They wear buckskin or cloth reproductions of clothing that was available in the 1700-1840s. They hide their coolers in wood boxes or under canvas coverings. Candle lanterns are used for light at night, fires are made using flint and steel, and meals are cooked over open campfires and in Dutch ovens. Traders gather along “Trader’s Row” to sell their trade goods, not unlike what the trappers traded for 180 years ago. What is the store Return / Warranty Policy? All items are warranted against defects in workmanship. If you are not completely satisfied with any of our products, we will refund or replace at your option within 30 days. All returned guns are subject to a 15% restocking fee. Items returned past 30 days are subject to a 20% restocking fee. Custom ordered items, gun kits that have been worked on and guns that have been fired are not returnable. Products manufactured by other companies are subject to their warranty and guarantee policies. INCIDENTAL AND CONSEQUENTIAL DAMAGES ARE SPECIFICALLY EXCLUDED FROM THIS WARRANTY.